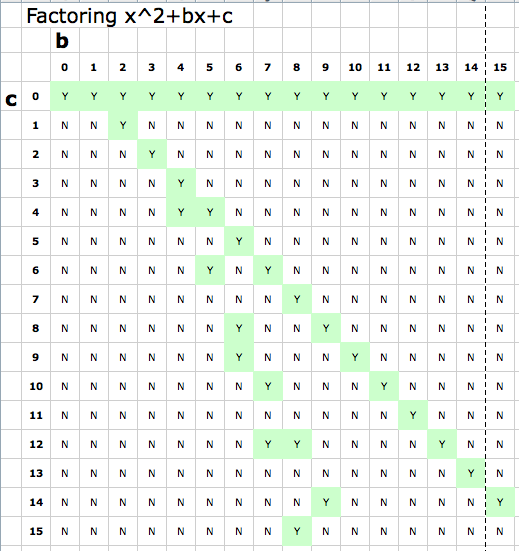 In his blog post, Factoring Schmactoring, Sam Shah took a look at how many quadratic equations of the form x^2+bx+c = 0 (where b and c are integers) could be factored over the integers and produced a chart that was a powerful reminder of just how few of these there are. After reading his post I fired up Mathematica and set to work extending Sam’s original chart to include negative values of b and c – the result of which is shown below. 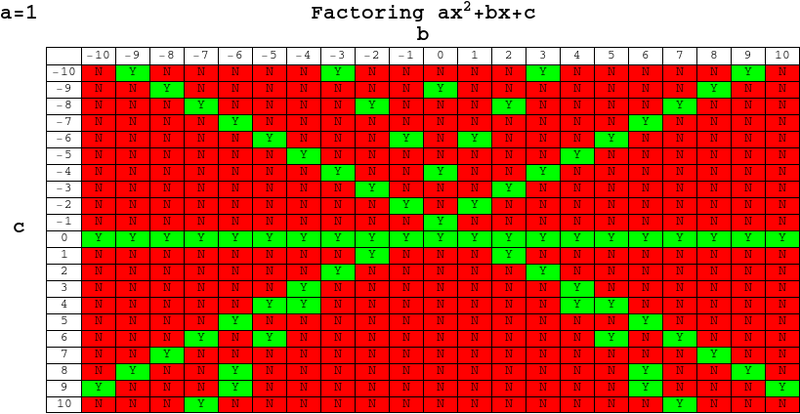 Out of 441 different quadratic equations, only 76 have integer solutions which is only 17.23%, and yet these are the only ones that succumb to the heavily drilled and killed method of factoring. Sam and his commentators discussed the serious question of whether or not we should even be teaching factoring these days (for the record, I think we should) but my concerns were much less lofty. I wondered if I’d make something pretty if I did a similar chart to the one above but for values of b and c ranging from -100 to 100. Of course, when dealing with values of a other than one, we should include the possibility of rational solutions so let’s do that and assign rational solutions to the colour blue – again click on the image below for the Mathematica-Payer compatible interactive version. I’m not really going anywhere with this – just having a bit of fun with Mathematica but comments are welcome. really a great fun ,but didnt see any fascinating pattern in it, a little disappointing ,yes ? Yes – a little disappointing that I didn’t find anything truly interesting but it doesn’t really matter. That’s the great thing about software like Mathematica or Maple – you can just play with ideas and it doesn’t take much time. It took me MUCH longer to write about this stuff than it did to do it. AS for the 3rd image – I see what you mean. Personally it reminded me a little of User Defined Graphics as used by old 8-bit computers such as the Sinclair Spectrum. 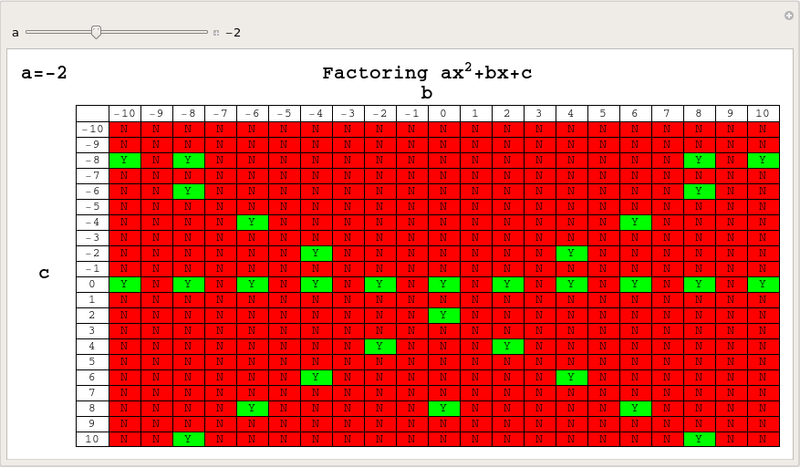 It’s not surprising to me that factoring is of so little value in solving random equations. Similarly, if we could collect all the numbers and pull one out at random, we would not be likely to grab a rational one (or even a real number). But still, students need to start with the baby steps: learn to handle rational numbers, learn to understand and work with factors, etc. And then, sometimes, it’s good for them (at least, for the best of them, lest they get too cocky) to be humbled by the overwhelming bloody red of the stuff that they don’t understand. I think those images are pretty interesting indeed! The “a similar chart to the one above but for values of b and c ranging from -100 to 100” image is striking … given that the student is generally told to “find x” . Scott is quite right, and the images are interesting! 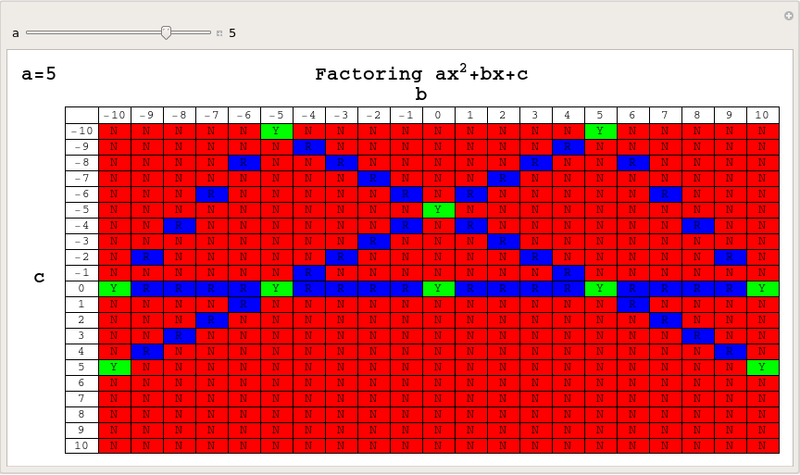 The quadratic X^2+bX+c factors over the integers precisely when it has integer roots. 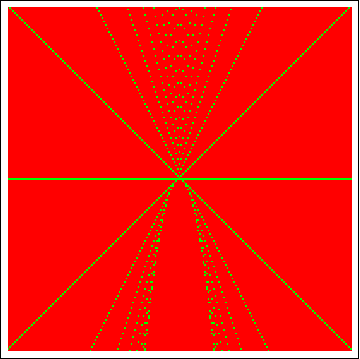 This means that there exists an integer n such that n^2+bn+c=0, or in other words c=-bn – n^2. These equations (c=-bn – n^2) define straight lines in the c-b plane – the “green lines” Scott mentions. So you can see that they do not share a common vertex: they intersect the b-axis at the perfect squares. And they are indeed the tangent to a lines to a quadratic, namely the quadratic c = (b^2)/4, whose lattice points correspond to the double root factorizations of our original quadratic X^2+bX+c; i.e. X^2+bX+((b^2)/4) = (X+(b/2))^2.